The internet can be an incredibly useful tool and is an ever-growing resource of information and social connections. It is a place to turn to for answers to questions, networking with people across the globe, and access to all sorts of information. With this said, it is also important to recognize the dangers that everyone, especially youth, may face online. There are predators who may try and take advantage of a young person, avenues for bullying, and even threats of identity theft. 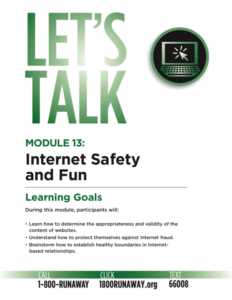 Module 13 recognizes these dangers and works with young people to better understand internet safety for kids and teens. The National Runaway Safeline (NRS) understands that using computers and other devices at home and in school is routine today. People often rely on it every day but unfortunately, not everyone on the internet has the best of intentions. There are people out there that will try to take advantage of others by spreading viruses, trying to get personal information, and even posing as someone they are not to try and abduct or exploit a young person. NRS often deals with youth in crisis who have met someone online and ended up in a dangerous situation. The best way to avoid becoming a victim is learning some internet basics, knowing what’s safe to post, and being careful of whom to trust. In the first two activities, youth will learn some basic knowledge about the internet and ways they can be safe while browsing. Understanding if a site is commercial (.com), educational (.edu), or non-profit (.org) can be helpful when trying to assess if the information presented is credible. Youth will get a chance to talk about guidelines and questions they should consider when looking at web content. When utilizing the internet it’s important for everyone, not just young people, to be careful about giving identifying information. Things like an address, phone number, and social security number are very valuable and can cause harm if they land into the hands of an untrustworthy individual. The best way to prevent internet fraud is to keep information private unless it is guaranteed the individual or website is legitimate. In 2001, the National Runaway Safeline added “internet relationships” to its list of issues identified. This was because of the frequency it came up in calls with runaway youth. The internet can be a great way to connect with people from all over the world. However, the anonymity of it can also be dangerous. Youth may sometimes find themselves chatting with people who don’t turn out to be who they say they are. In the second half of Module 13, the focus turns to avoiding other types of fraud that could lead to more physical harm. By discussing scenario topics like bullying and meeting someone online, youth can role play how they would deal with these types of issues if they should arise. It’s important for young people to have realistic conversations about using the internet in a responsible way. Youth should be kind to others even when their comment is anonymous and being safe when connecting with others they don’t know. Be Careful What To Post. Anyone with access to a computer can see the information or pictures a youth posts online. Youth should carefully consider what they post, including address or location, screen names, and other identifying information. Be Careful Who To Trust. Anonymity can be a captivating thing about the internet. It’s a place where people can be who they want. A youth may think they know someone based on a profile or conversation, but that person may be someone entirely different. This doesn’t mean a youth can never connect with someone over the internet. It is important to use caution when getting to know someone online. And always be careful when meeting an online friend in person. It’s important for youth to remember ways they can be safe like meeting them with a friend or family member. Be Careful What To Say. Teasing and bullying online is just as bad as it is in person, and some of it is even illegal. It’s also important for youth to speak up when they see negative behavior or bullying. They should also understand they can tell a trusted adult or the authorities. When used in a safe way, the internet can be a great place to learn and to express oneself. Teaching youth about the possible dangers and ways they can keep themselves safe is a good start. Please take a look at the resource page at the end of the module for additional information and online services.